Brain-boosting product EZ Health Solutions Super Brain Boost 1554 will be looked at in this review. This product is intended to support focus, clarity, concentration and memory. Additionally, it increases alertness and reduces mental fatigue. To find out more, continue reading to discover our thoughts on the product and to see if it might be a viable option for enhancing your mental health. Acetyl-L-Tyrosine is an amino acid necessary for the production of neurotransmitters, which can affect motivation and alertness, and it is supposed to help with cognitive function during times of stress. However, this ingredient is not listed on the supplement’s label despite being mentioned by explicitly on the manufacturer’s label. A misprint on the label seems to be the most likely answer to this issue. Bacopa extract has been chosen for this product because of its properties to enhance cognitive function and memory. The capsules are made with gelatin, which means this product is unsuitable for vegetarians. One (1) capsule is to be taken daily although it is possible to increase this number to two (2) capsules. Dosage cannot exceed two capsules in a day. There are no side effects listed by the manufacturer, which is worrying because many of the ingredients have the ability to cause serious side effects. The manufacturer does warn pregnant and breastfeeding women, those taking blood thinners and children under 18 to avoid taking this supplement. Those with known medical conditions are told that a physician should be consulted before taking Super Brain Booster 1554. St. John’s Wort is dangerous to take it within the two weeks leading up to a surgery as it may cause serious heart complications. As a result, those wishing to use this product must take caution. When directly bought from the manufacturer, a container of Super Brain Boost 1554 with 60 capsules sells for $39.99. No guarantee is outlined by the manufacturer. Those wishing to return items must contact their customer service and there is no guarantee that a refund of any kind will be granted. As well as this, customers made no reviews of this supplement although the manufacturer has left facilities on their website that allows you to do so. The absence of reviews suggests that the product is either unpopular or that the supplement is ineffective in some way. Brain Booster 1554 requires a lower dosage than other brain boosting supplements available, which suggests that it is stronger. At $39.99, it is highly affordable, especially considering that it may contain more active ingredients than other brain boosters may. However, this product also has its downside. Many people would find this product unsuitable for them. Vegetarians, pregnant and breastfeeding women, children and those who take blood thinners are unable to take this product, as well as some with medical conditions may find that they are unable to take it depending on the nature of their condition. Another negative is the lack of guarantee for the product. There is no certainty of being able to get a refund if you find that the product does not work for you. There are also no product reviews, which makes it difficult to determine if the supplement is effective. As a result, you may discover this product is not suitable for your needs. 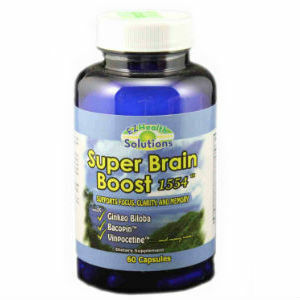 Henry Costa	reviewed EZ Health Solutions Super Brain Boost 1554	on November 20th	 and gave it a rating of 2.5.